So, you’re having a baby. And feeling all the feelings. As you get ready for your baby shower, it can be both exciting and overwhelming trying to figure out what to register for. We asked some in-the-know parents what items they loved to receive, and they delivered (ahem) in a real way. Creating a few registries will ensure you include everything you’ll need, along with a few special things you can’t resist. We like that Buy Buy Baby has a checklist that makes sure you’ve covered the basics since there are so many things (looking at you nursing pads) you’ll be glad you have when you need them. Once you get the basics locked down, you can add additional items with another registry or two. Amazon is great for things you may want to reorder like diapers or formula or pulling from multiple stores. One of the perks of creating a registry is being able to see how everything looks together. You can decide if you’re a prints-on-prints family or lean toward clean shapes and classic colors. Pass along your registry information to the shower hosts so they can include registry links in the invitations on a desktop computer—it’s easy to add to registries to either a Flyer invitation or a classic card invitation. Simply paste in the registry link and name the registry to share along with the party details. 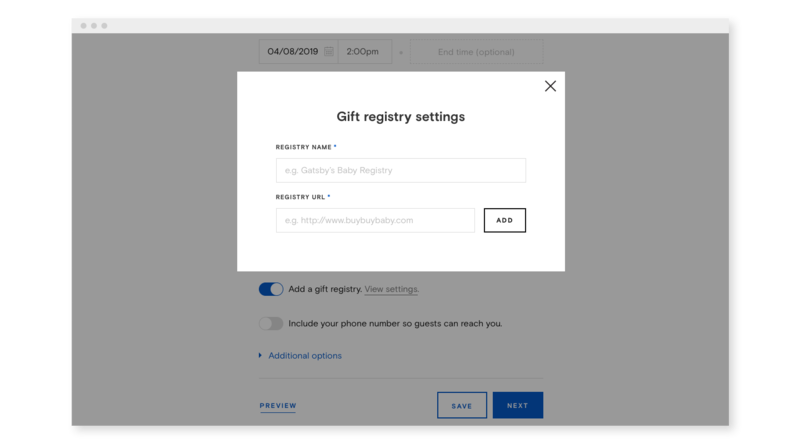 This way your guests don’t have to play telephone to find the right registries. While soon-to-be grandparents tend to start purchasing early, most shower guests will make last minute purchases, so set up your registry early on and continue to check in on and update your list as your shower approaches. It’s easy to add a link to your registry with Paperless Post Cards or Paperless Post Flyer. Plan for needing less newborn-sized clothing than you’d expect and focus on clothing in 3-12-month sizes since they’ll grow out of sizes quickly. Look for kimono-styles that don’t go over the head to help with stressful outfit changes. Registering for a few things in each size and a range of price points will give people a sense of how you’d like to dress your kid, even if they end up passing along hand-me-down outfits or finding something similar. If you’re into prints, gender-neutral styles or all pink everything, it will come through in the registry. Ahhh, sleep. It seems so simple now. For the first few months, you’ll really just need a bassinet or co-sleeper along with pacifiers and a handful of swaddle blankets. As they get a little older and move to a crib, you may add quite a bit more to your routine to get them sleeping as regularly and soundly as possible. Go ahead and register for these larger items now, even if you won’t use them right away. We also suggest stocking up on at least one extra crib sheet, because babies. Toys tend to accumulate whether you want them to or not. Start small by covering the basics for tummy time and story time and you’ll be set for a while. We like a baby gym that makes it easy to add and subtract hanging elements to mix things up as the child grows. Guests delight in passing along a favorite story to start a child’s book collection. Consider a mix of sweet classics, silly rhyming words and empowering new stories. However you choose to feed, you’ll want to create a comfy go-to spot with rocker or glider and a feeding pillow. Consider asking friends for streaming and Kindle recommendations or add a magazine subscription to your registry for late night feedings. Babies tend to prefer one brand of bottles over another so start with a few of one type and go from there. Nobody has ever regretted having a diaper pail—you’ll be glad you have it when your baby starts eating solid food. Simple and straightforward work best for the bath as you can add small toys to their routine as they grow. A foldable bathtub makes for easy storage, and a spout cover protects their wriggling head from bumping against the tub. We won’t say “diaper bag” if you don’t. For everyday use, go with a backpack or minimal carryall that anyone can wear when they’re out with the baby. The stroller and car seat that are right for you will largely depend on your neighborhood and your home, so ask your neighbors for their thoughts and keep in mind where you’ll store it. Even if you have the stroller covered (thanks, Grandma!) you may still want to include it on the registry so that people will know which attachments and accessories go with it. It looks like stormy weather: Call for a baby shower with our classic invitations or a casual Flyer. For a little inspiration head to our guide to hosting a chic shower.